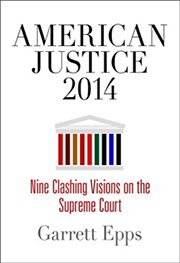 This month, Garrett Epps, Professor of Law at the University of Baltimore School of Law and the Supreme Court correspondent for The Atlantic, visited the law school to talk about his latest book, “American Justice 2014: Nine Clashing Visions on the Supreme Court” (University of Pennsylvania Press, 2014). Before his remarks, Professor Epps spoke with Professor Dawinder “Dave” S. Sidhu, a former Supreme Court Fellow. DAVE SIDHU: I must first thank you for being so gracious when I introduced myself to you in, of all places, the cafeteria of the Supreme Court. I am grateful that you are spending time with us in Albuquerque, particularly because I understand that you have many obligations teaching and covering the Court. First, what are your thoughts about whether the Court should televise oral arguments or opinion announcements? GARRETT EPPS: My bottom line, which is semi-facetious, is that cameras in the Court will happen the day after Justice Scalia leaves the Court. I think having cameras in the Court would be fine, but I am not sure if it will produce better decision-making by the Court. I am mystified as to why the Court does not upload the audio of the oral argument on the same day of the argument, as it does with the oral argument transcript. I think that the reason they don’t upload the audio is that they don’t want the argument to be on the news, which is not a good reason. SIDHU: You have had the opportunity to observe many oral arguments at the Supreme Court. What advice would you give to an advocate who will appear before the Justices for the first time? EPPS: To start with, you have to know your case, and you know the record cold, to the point that there is no visible struggle. If that’s not the case, it can be embarrassing. Second, enjoy it; the argument is your chance to have a chat with the Justices, who are uniformly very smart people. Third, use the argument to find out what’s on the Justices’ minds. You have to remind yourself that the argument is a ten-way conversation, and that you are #10 in the order of importance in that conversation. Fourth, while you have to make it easy or easier for the Justices to side with your client, you have to do so in a way that is honest. You must keep your credibility. You need to have answers to adverse precedent. It is astounding to me how many advocates do not have answers for the obvious questions. If you are not ready for that, you’re in a world of hurt. You cannot get thrown by the Justices. Another thing I have seen is advocates who focus on how “good” their client is. People come to the court so wedded to their client and their position that they can’t take a step back. They need to answer the Justices’ questions, not advocate. The Justices are attempting to develop a rule of law. I remember Justice Powell saying in Bakke argument that the advocate’s role is to help us come up with a good rule of law. SIDHU: The Supreme Court press corps have the challenging task of helping the public understand difficult legal issues, often under tight time pressures. How would you describe the corps? EPPS: Someone said to me once, aren’t you sad to be around a bunch of lawyers all the time. I said, “Lawyers are socially an improvement over reporters.” The Supreme Court reporters, however, are an exception. They are not there to scoop each other; they have the same materials, they are trying to understand what the Justices meant from those materials. After any important oral argument, you’ll see Adam Liptak, Jess Bravin, Marcia Coyle, Robert Barnes, gather around and ask each other what the Justices were trying to get across. They call me “professor,” but they are my faculty. Lyle Deniston has been covering the court since 1958, and I can learn so much from him. They are perfectly willing to talk to me. SIDHU: Do you have any thoughts on the proliferation of a specialized Supreme Court bar? EPPS: In some ways it’s regrettable, but it’s inevitable, for a number of reasons. First, the court hears so many fewer cases, so the concentration on oral argument is more intense. You really need people who can frame the issues for the Justices either in party briefs or in amicus briefs (and I think the Justices do take seriously amicus briefs). This bench is “hotter” than any court in history, as you know. This puts a premium on advocates who can frame arguments before the Court and not get rattled. I don’t think this will change while John Roberts is Chief. SIDHU: As an academic, what is your reaction to comments by Chief Justice Roberts and others that legal scholarship is often too obscure and abstract to be helpful to the bench? EPPS: The Chief Justice has a way of saying things that sounds flipper than it should. He is making a point, which is a point that a lot of judges make. In fairness, consider how busy these guys are, when they are looking at specific issues or cases, they are not thinking, ‘what is the John Hart Ely theory of this.’ They want direct guidance. If you want to have an influence on how the Justices think, you have to write a certain way. You misapprehend the nature of law reviews if you think they are a failure when Justices aren’t reading. SIDHU: Speaking of legal writing, what influence, if any, do you think blogs can have on legal issues and debates? EPPS: They have a huge impact, if done well, on the dialogue and on the Court. I couldn’t tell you the extent to which Justices or clerks read them, though I imagine clerks do read them. Good, thoughtful, online scholarship and commentary does have an impact on how a case is argued. You will see, in the run up to major cases, the people behind the parties will pay attention to what is written online. They also educate the profession; they can be helpful for lawyers both leading up to argument and after argument. The online law journals are a tremendous innovation. SCOTUSblog is an important place to publish. SIDHU: I have great affection for the University of Baltimore School of Law, where I had my first teaching position. What can you tell folks in New Mexico about UB? EPPS: At first glance, UNM and UB aren’t that similar. But they both emphasize clinical legal education. UB is not as thoroughly imbued with the clinical mentality as UNM—what law school is?-- but we are close. Our clinical faculty is outstanding, they are tenured. Our new building basically has a law firm in it, with its own security, for the clinics. Our students receive excellent training. That’s something that UNM has been known for for half a century. We both give opportunities to students who are in many respects “outsiders” in the law. Many of our students are the first to attend law school, or are second-generation students from immigrant communities. I have seen these students attain extraordinary achievements. Our students go on to become judges, they are very important in state government, they really serve the community. We change their lives. And of course we are the only law school endorsed by The Wire. SIDHU: Finally, and perhaps most importantly, who is going to win “The Bachelor”? EPPS: That is a toughie. This season it almost seems like a contest to lose. Everyone is betting on Britt, but she doesn’t take showers. Kaitlyn could appeal to a farmboy. But I can’t tell what he’s thinking. I just want it to be over with so we can get to “Bachelor in Paradise,” which is real reality TV. [This week, Professor Epps responded to developments in the series:] Time has passed. For reasons I can’t fathom, Chris sent Kaitlyn home. Meanwhile, Chris Harrison has asked Ashley (“I feel like we’re in the . . . Mesa Verde . . . .”) S. to come on “Bachelor in Paradise,” I assume on the grounds that there’s not enough craziness on TV.